I had always wanted a sibling, and I begged and pleaded with my parents for one growing up. I found out later that my parents had trouble getting pregnant, so they used in vitro fertilization to conceive. Finally, when I was thirteen, we got the best news ever—there was a baby on the way! We couldn’t have been happier. We found out it was a boy and began to fill his room with all things baby: a crib, a rocking chair, an endless amount of clothes and toys. We even gave him a name, Cole Thomas. But midway through my mom’s pregnancy, we were told that baby Cole had an incurable and rare kidney disease known as ARPKD (Autosomal Recessive Polycystic Kidney Disease). That moment turned our lives upside down. But after connecting with other families that had children with the same disease and talking to doctors who specialized in it, we had hope that he would make it through this incredible fight. When Cole was born, he was a fighter. We spent day after day praying and doing everything in our power to ensure that Cole would have the best chance of survival when he was born. My mom even relocated to NYC from Albany, NY, so that my brother would have the best medical team possible. It was extremely difficult to be away from my mom for months and face the thought of losing the brother I had always wished for. Every step of the way, my parents were open and honest with me about what was happening. When Cole was born, he was a fighter. He didn’t want to give up, but his condition was more than his little body could handle. The baby brother I had waited my entire life for only lived for two days. Death is never easy, and facing the grief that comes afterwards is even more difficult. As a child, this loss was tremendously difficult. There was nothing worse than watching my parents struggle with their own grief, and being afraid to bother them with mine. We all had person-shaped holes in our hearts after losing Cole, and nothing will fill that void. Although I have blocked out many memories from that sorrow-filled time, I will never forget how we got through it together. We were there for one another and we picked one another up, time after time, until finally we were able to overcome our grief. My friends continued on with their typical teenage activities, but I was stuck. I am thankful that my parents got me the help I needed to cope with my grief. The summer after Cole died, my parents signed me up for grief camp. As a thirteen-year-old, I was more worried about what my friends would think than about how I was feeling inside. I was sad and alone; I kept my feelings of grief and loss to myself, because no one really knew what I was going through. How could they? My friends were supportive in every way they knew how to be; they even went to the school counselor’s office the day Cole was born to call me and ask how Cole was doing, which meant a lot. Yet they hadn’t experienced what I had been through and they didn’t know what to say to me. My friends continued on with their typical teenage activities, but I was stuck and I didn’t know how to escape the grief that was holding me back. I didn’t know how much of an impact Camp Erin would have on my life. It showed me that I was not alone in this journey and that everything I was feeling was normal. Making friends and gaining mentors who had experienced loss, as well as participating in grief activities, taught me how to express my feelings and talk about my loss. I’ve returned to Camp Erin as a camp counselor every year, helping other children to find hope in their healing. Helping those around me has given me motivation to push on with my life, and shows me that if I can help others to heal, I can continue to heal as well. I speak for all the children who have suffered a loss, and I want to encourage all of them to reach out for help. Not a day goes by that Cole is not on our minds and in our hearts. I tell my story to share with others who are grieving that even when it seems unbearable to keep going, there is light at the end of the tunnel and life goes on. I have come a long way in my grief and am sure that without the support and guidance I have received, I would not be where I am today. Since the loss of my brother, I have pursued my passions and surpassed my goals. I graduated high school, completed my bachelor’s degree, and studied abroad in Ecuador, helping disadvantaged children. I am currently working on my master’s degree in child advocacy and policy. I now have a six-year-old brother who is the light of my life and my everyday reason for why I continue to do what I do. I speak for all the children who have suffered a loss, and I want to encourage all of them to reach out for help. I also want to encourage all the adults who may have a grieving child in their life to be the voice for that child and help them find the hope and support that they need to overcome their grief. 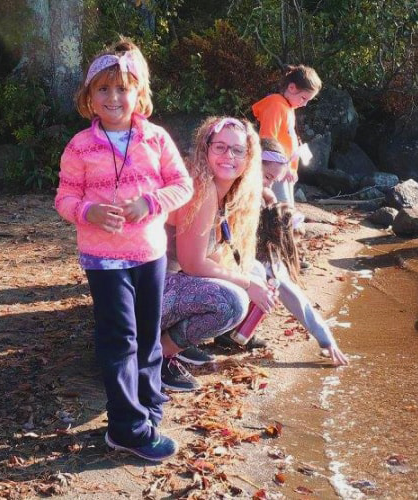 Peri Smith returns to Camp Erin, a weekend camp that combines traditional, fun camp activities with grief education and emotional support every year as a camp counselor.